So Rainn Wilson, who has turned in a masterful performance as borderline psycho Dwight Schrute for nine seasons now, was supposed to get his own spinoff called The Farm. The idea was that Schrute leaves Dunder Mifflin and runs a bed-and-breakfast full-time, along with his colorful extended family: his slacker pot-farming brother, his liberal sister, her odd-duck 9-year-old son, and his uncle “Heinrich Manheim … [who] is charming, greedy, manipulative … and just may have had to spend time in Argentina following World War II.” But on Monday, Wilson tweeted “NBC has passed on moving forward with The Farm TV show. Had a blast making the pilot — onwards & upwards!” And while NBC isn’t confirming yet, Vulture reports that the plan is to air the pilot as an episode of The Office and leave it at that. So, why? Theory No. 1: NBC hates old NBC. Another thing that happened yesterday: In a largely unprecedented move, NBC announced that Up All Night was going from single-cam — the more realistic style used by all of the network’s cult comedy hits — to multi-cam in an effort to broaden its appeal. NBC chairman Bob Greenblatt has already been explicit about moving away from all old vestiges of the “nichely appreciated” era of NBC, and toward a brighter, more mass-approved tomorrow. And with The Office in its last season, nipping its spinoff in the bud would seem to be one way to really start clean. Theory No. 2: NBC hates beets. 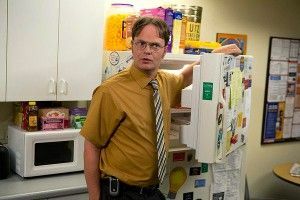 It hasn’t been made totally clear if Schrute was moving to run the beet farm hotel he currently owns full-time, or if he had found himself as the inheritor of a whole new hoteling operation. Either way: You know Dwight “Beets, bears, Battlestar Galactica” Schrute would have found a way to get the delicious red root vegetable involved somehow. Therefore, NBC hates beets.